✔ Premium Quality ➠ Durable materials, waterproof, machine washable, mud resistant. You can wash it anytime. ✔ Multi Functional ➠ You can also use this dog grooming brush for bathing, gently remove dead loose hair from top and under coat. ✔ One Size Fits All ➠ It has adjustable strap which fits perfectly on men and women hand's size. It may even fit your kid's hands. 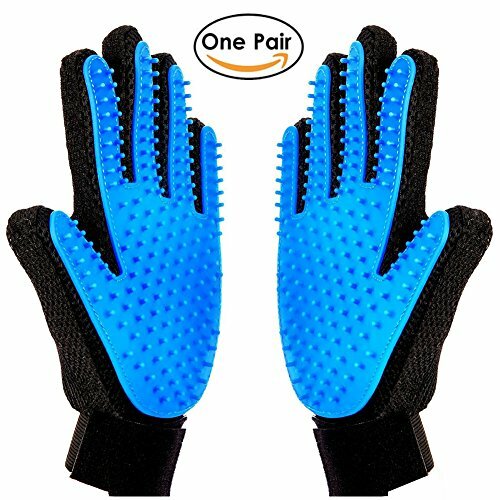 ✔ Hair Remover Perfect ➠ for long, short and curly haired dogs, cats, and other pets, grooming the hair quickly, gently and effectively; The shedding hair sticks to the glove, making it easy to peel and throw hair away. Even your kids can use it. Safe for kids and pets. Does your dog or cat runs away from you when you come to brush his/her fur with a grooming tool? Massage your pet as long as you want and easily peel the shedding hair sticked on the gloves and throw it on the wastebasket. Click on ‘Add To Cart’ and consider buying 2 one for you and one for your friend as a gift, she will thank you later.